Steven Colbert is a genius of satire. 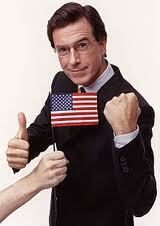 HAPPY BIRTHDAY Steven Colbert! Brush top of plank with 1 Tbsp. oil and place fish on plank. Brush fish with remaining oil. With gloved hands, rub fish with garlic and sprinkle with salt and pepper. Place on grill; cover grill with lid. Grill 15 to 20 min. or until fish flakes easily with fork. Sprinkle with dill and serve with lemon wedges. Look for a salmon fillet that is about 1-inch thick.